An exciting new signature race for Australian Racing has been launched by Racing Victoria and the three Victorian metropolitan racing clubs; Victoria Racing Club, Melbourne Racing Club and Moonee Valley Racing Club. The All-Star Mile gives fans a chance to vote for their favourite selected horse with an incentive for one lucky voter picked for each All-Star to become a nominal owner of that horse. They will win a share of $500,000 in prizemoney as a part of the $5m overall prize. The race is on Saturday, 16 March 2019 with a field of fourteen plus four emergencies. 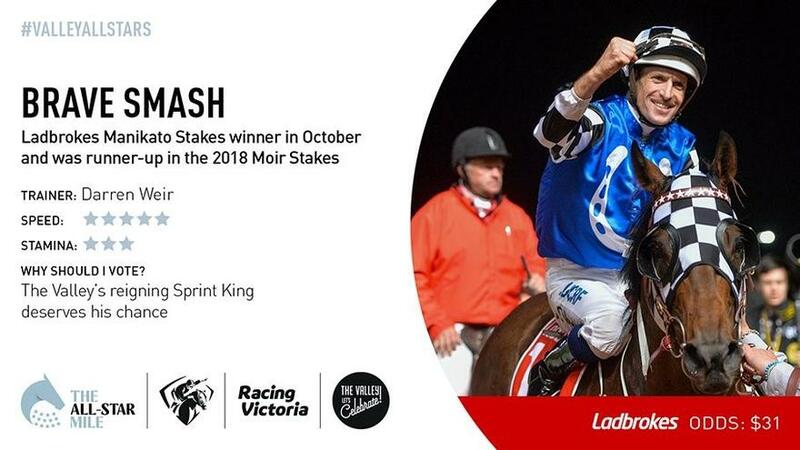 Australian Bloodstock is proud to have Brave Smash nominated for this exciting new race.